Ronald Reagan UCLA Medical Center is the state-of-the-art building designed by I.M. Pei. The RRUMC has 517 beds and is equipped with the latest in medical technology and health care delivery systems. More than 300,000 people from Los Angeles, from across the country, and from around the world come to UCLA Medical Center each year to receive care from some of the world's best healthcare providers. More than 120 of our physicians are cited in The Best Doctors in America, which is based on an extensive poll of thousands of medical specialists. In addition, UCLA has been ranked as the best hospital in the Western United States for over 15 years by U.S. News and World Report. Ronald Reagan UCLA Medical Center is an active tertiary and quaternary center. We house the largest transplant center in the world and attract many patients seeking expert care for a range of unusual illnesses. Additionally, a very large referral base of primary care physicians ensures a large patient population allowing our residents to master the treatment of common diseases. Ronald Reagan UCLA Medical Center is also a National Cancer Center and has been awarded NIH Center grants in Cardiology, Pulmonary Diseases, General Surgery and Oncology. In addition to the hospital, the Gonda research building has just been completed, and two new research buildings are now under construction. The hospital, and the research centers are all situated on the general UCLA campus, a beautifully landscaped and architecturally innovative campus with abundant opportunities for residents to involve themselves with campus life, including music, theater, art and athletics. 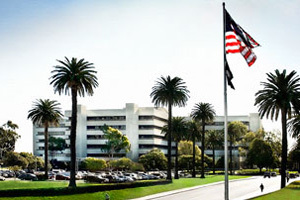 The VA Greater Los Angeles Healthcare System is the largest VA complex in the US with 1,350 beds and 3,500 employees. It provides primary medical care to a large population in Los Angeles in addition to serving as a tertiary-referral facility for the southwestern United States. The Medical Center offers medical, surgical, mental health, geriatric, specialty imaging and interventional radiology, radiation oncology, and advanced rehabilitative services. The attending staff are faculty members of the UCLA School of Medicine.